Sri Lanka continued to maintain a vice-like grip on the Galle Test on the third day, but instead of pushing for the kill after bowling out Pakistan for 100, they inexplicably decided to bat again. Even a 372-run first-innings lead, the forecast for rains over the next couple of days and a relatively fresh bowling attack that had bowled for less than two sessions were not enough to convince Mahela Jayawardene to enforce the follow-on. They eventually declared after batting more than three hours, stretching the advantage beyond 500. Then, in the hour or so they had at Pakistan's batting in the second innings, they made big strides towards victory by removing three top-order batsmen. The other major talking point was the umpiring. In a week when the ICC will yet again discuss the Decision Review System, the Galle Test provided more evidence for making the system mandatory for all international matches. There had been a handful of wrong umpiring decisions in the first two days, and another one early on Sunday undermined Pakistan's already slim chances of mounting a fightback, as Younis Khan was adjudged lbw even though he inside-edged the ball. Later in the day, Tillakaratne Dilshan was incorrectly declared not-out after gloving a ball to the wicketkeeper, and then given lbw when the ball was going over the stumps. The umpiring was poor, but Pakistan can't hide behind that for their abject performance in this match. Pakistan had been given a taste of the challenge ahead in the opening over of the day as Nuwan Kulasekara first found Younis' inside-edge and then the outside-edge. The spinners kept testing the batsmen with turn and bounce, and once Younis fell to Rangana Herath in the 10th over of the day it seemed Pakistan would be bowled out quickly. Mohammad Ayub, Pakistan's oldest debutant since 1956, however, showed remarkable composure against the spinners, defending solidly and using the sweep regularly. He wasn't flustered by the pace of Nuwan Pradeep, who was regularly near the 90mph, carving him for a couple of boundaries when provided the width. He was less composed when Adnan Akmal called him for a second after paddling the ball to fine leg. Akmal was going to the danger end, but Ayub started, hesitated and then turned back, and eventually both batsmen found themselves at the same end. Akmal was livid, shouting "My call, my call, I said 'yes'," at Ayub before departing in a huff. 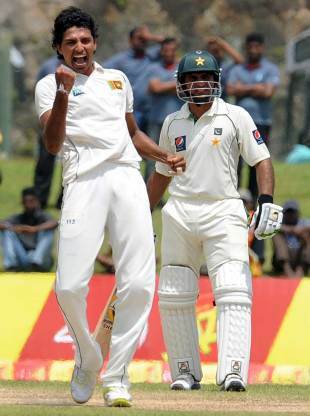 That exposed the Pakistan tail, and Sri Lanka's spinners finished off the job at the stroke of lunch. After the break, to everyone's surprise, it was the Sri Lanka openers who walked out, and the widely expected follow-on wasn't to be. The decision would have pleased Tharanga Paranavitana, who got a no-pressure second chance to audition for a permanent place at the top of the order. He swiped a couple of sixes (after having hit only two in his other 51 Test innings) but for the second time in the game, he was made to look foolish by Saeed Ajmal, as he missed the doosra by a foot to be lbw. Junaid Khan was the other player happy with the Sri Lankan move to bat again. This is his first big game after four months out with a knee injury, and he had looked listless in the first innings, but was more of a threat second time around. He found some rhythm in the second innings, beating the bat on several occasions and picking up three wickets to boost his confidence . Of the Sri Lanka batsman, Dilshan enjoyed himself the most. He provided the early thrust as he drove, cut and swept the Pakistan bowling to bring up his second run-a-ball half-century of the match. He was dismissed by Junaid for 56, and walked off saluting the crowd. The other heavyweights in the line-up didn't do much, but it didn't matter as Sri Lanka were already in an exceedingly comfortable position. After the declaration came, Pakistan had to see out 16 overs before stumps but their batsmen blundered again. Mohammad Hafeez's woeful tour continued as he was unsure how much movement Kulasekara was getting, and edged through to slip. Taufeeq Umar was lbw looking to shoulder arms in the first innings, and this time he was gone leaving a huge gap between bat and pad when looking to defend. Herath was menacing even with a new-ish ball, and had Azhar Ali pouched low at slip by Thilan Samaraweera. Pakistan were down to 25 for 3 and their only hope at stumps was for the Sri Lankan monsoon to strike and wash out major parts of the remaining two days' play.